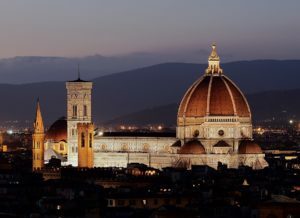 To decrease crowding, Florence has banned people from eating on four of the city’s busiest streets: Via de’ Neri, Piazzale degli Uffizi, Piazza del Grano and Via della Ninna. The ban is in place during the most popular mealtimes – from noon to 3 p.m. and from 6 p.m. to 10 p.m. – and those who violate it will be fined between €150 and €500. On Via de’ Neri are gelato shop Gelateria dei Neri and three locations of sandwich shop All’Antico Vinaio, both very popular establishments that attract lots of customers but have limited indoor seating. As a result, many patrons take their food to-go and eat it on the streets while walking around or sitting on sidewalks, often leaving trash behind and blocking the crowded, narrow streets. Business owners have received and posted signs explaining the rules in both Italian and English and advising tourists to “respect residents, traders, and workers of this street.” The ordinance will be in effect until Jan. 6, when its effectiveness will be assessed. “If tourists behave in Florence as they would at home then they will always be welcome, especially if they want to try our gastronomic specialties,” wrote Florence Mayor Dario Nardella in a Facebook post. However, others disapprove, saying the city should have installed more benches in the area before implementing the law. Florence has faced similar problems in the past: Last year, the city began hosing down the steps of churches during lunchtime to discourage people from eating there. Other cities around Italy are also enacting such bans, including a rule against eating on or around fountains in Rome. Love this story! I think it is important that visitors to Italy know that, although they are always welcome, there are limits to what these ancient cities can take! I was just in Florence marveling at the number of people who walk across this “old bridge” every day. And yet it still stands, sturdy as ever. Amazing!